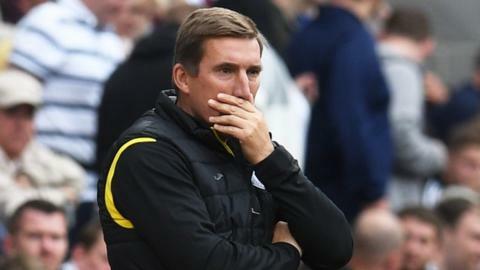 Manager Alan Stubbs has left St Mirren after less than three months in charge. The 46-year-old, who won the Scottish Cup with Hibernian in 2016, replaced Jack Ross at the Simple Digital Arena in June. The Buddies sit second-bottom of the Premiership after one win and three successive defeats. "Careful consideration was given to this decision," St Mirren said in a statement. "The search for a new manager will begin immediately." The club hope to have a new manager in charge for their next match, at home to Celtic on 14 September, and a board meeting will be held later this week. Coach Brian Rice will take the first team for training in the interim. Former Celtic and Everton defender Stubbs moved to Rotherham after helping Hibs win the Scottish Cup in 2016 and left the Millers four months later after one win in 14 matches. He remained out of management until taking up the St Mirren vacancy and the club recruited 13 players during the summer transfer window. The Paisley club opened the new season with progress from their League Cup first-round group and an opening Premiership win at home to Dundee. However, league defeats to Rangers, Livingston and Hearts followed and Stubbs' side also lost to Aberdeen in the League Cup. "I've watched three out the four league games this year. They got a great result first up against Dundee. "They go to Rangers, always tough. Livingston, you look at it - six-pointer, that's the game that they'd quite fancy to win at home and they never turned up, never had a shot on goal and I think that was where the grumblings really started to happen for St Mirren fans. They weren't happy after that performance. Livingston steamrolled them that day. "They've gone to Tynecastle on Saturday and conceded four within the first half of the game. "It shows that there's a lot of work to be done and in terms of the recruitment that has been done, that's the argument isn't it? They haven't recruited well enough. "Up front, they lack goals. In the back, they've recruited but not so well." "To an outsider it probably seems a bit harsh after only four league games, but everyone connected with the club who follows St Mirren will welcome the news. "It was a brave decision by the board to admit they made a mistake but they have moved quickly to correct it. "There is a lot more to this than just results. The players are very unhappy with how things have gone under Stubbs and Darren Jackson; the morale of the team has plummeted and there is a lot of dressing-room unrest. "Stubbs inherited a club very much on the up under Jack Ross but it was clear from very early on that this wasn't an appointment that was going to work. "I would love to see [Alloa boss] Jim Goodwin get a crack at it. He is a club legend who will instantly galvanise things. His lack of experience perhaps may go against him. Jim McIntyre is a good, experienced manager too who has done it previously in this league."